My most recent make is a simple, fitted knit dress, perfect for spring time! As I mentioned in this Instagram post, I love having the ability to make clothes custom fit to my body and my style. This dress is a comfortable length (not too short for chasing a toddler around) and its fitted but not too tight. This thick ponte knit fabric from Joann is very forgiving, also not at all see through! One night I was itching to sew something, but I had no project in mind. 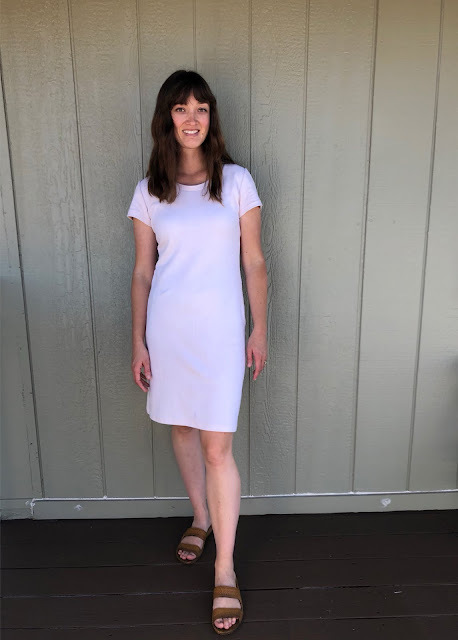 I started digging through my stash, hoping to use up something that I already have, and I stumbled across this white ponte knit from Joann. I knew right away that I wanted to make another knit dress (my last one gets worn all the time! ), however I didn't want it to be stark white. 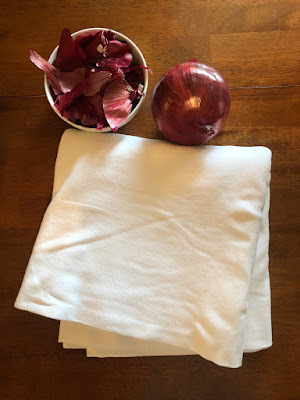 Luckily I've been saving onion skins and avocado pits to naturally dye fabric, so I pulled my red onion skin stash from the freezer! I boiled the onion skins in a big pot of water for over an hour. 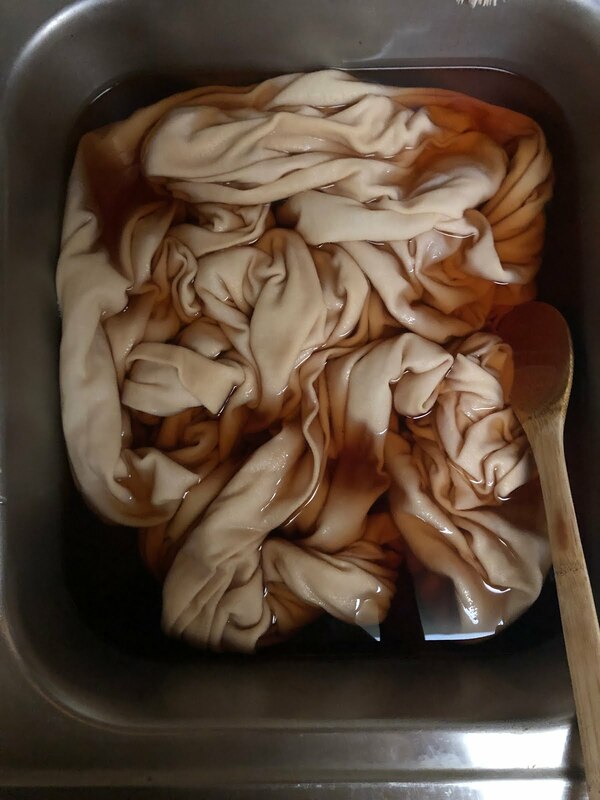 I then got the fabric wet with hot water and put it in the dye bath (I used my sink since my pot was not big enough for that much fabric). 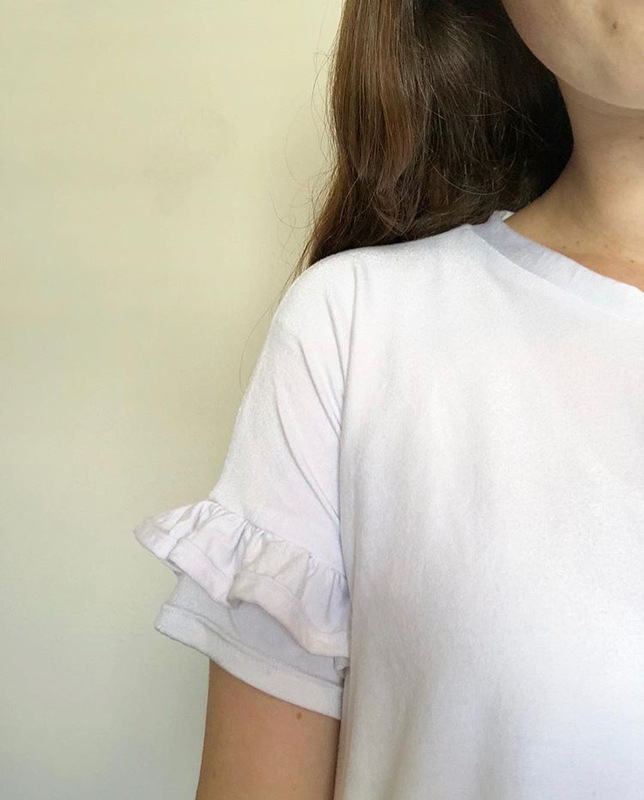 The fabric soaked overnight and the result was this beautiful blush shade! It was just what I wanted, something light and breezy other than stark white. Such a beautiful subtle pink color! 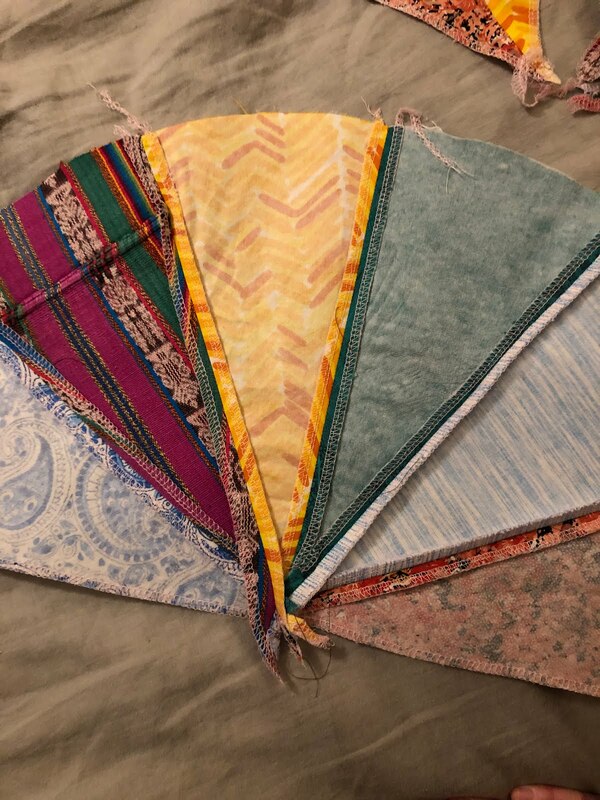 I am so inspired by the beautiful colors that Sara from Farm & Folk achieves from natural dyes and the beautiful quilts that she makes. 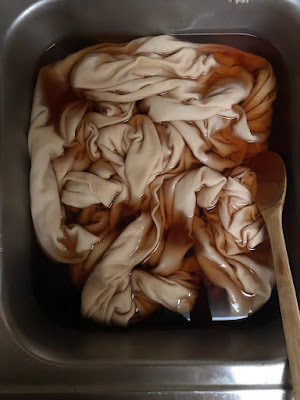 I plan on doing a lot more research and learning all I can about natural dyes. I got started right away with turning it into a dress! 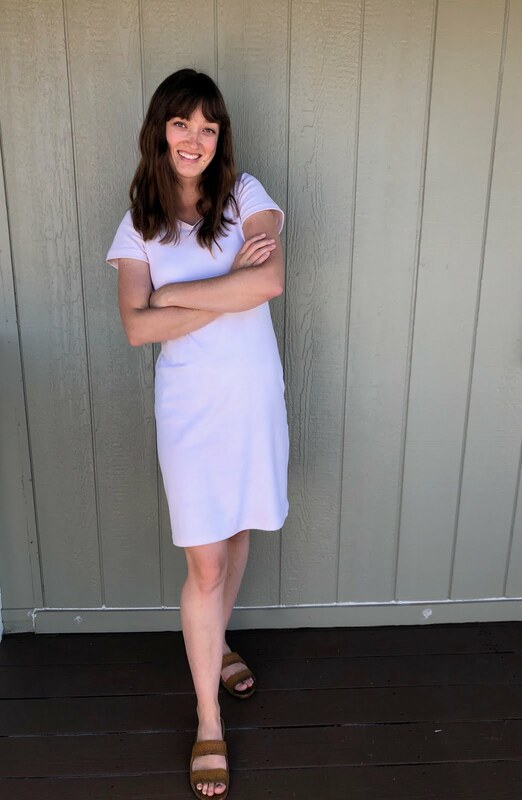 I used the same self drafted pattern I used for my last dress, serged it all together, and used a double needle for the hems. It all came together (cut out and sewn) in less than two hours! I am so happy with how it turned out! It will be a staple in my spring/summer wardrobe, and I might need to make a few more. For my body type, I have to lengthen dresses to avoid them being too short, and I often have to drop the waist (my torso is very long). I love the freedom that comes with sewing my own clothes. I get to make whatever works best for me and as a result I have a closet full of clothes I feel so great in! 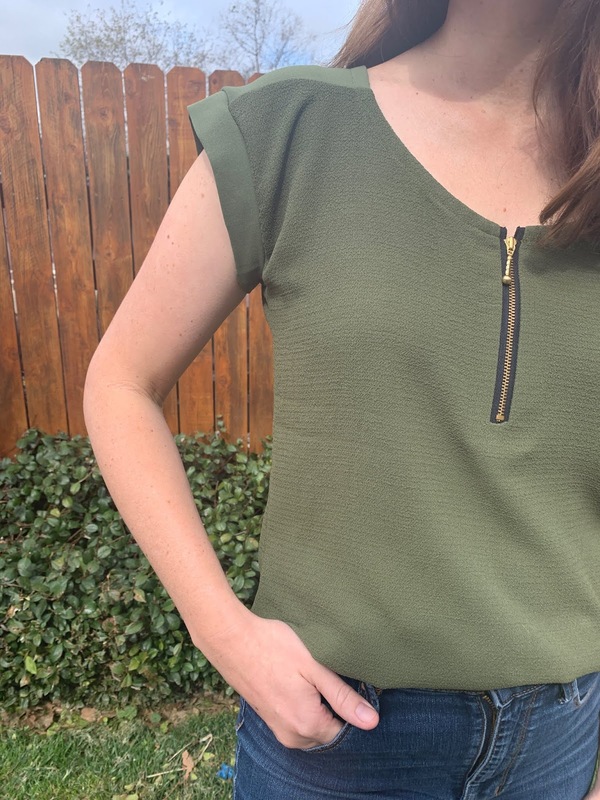 Favorite and most worn make as of late: the Five Points Blouse. This pattern is from the Feb/March issue of Sew News and is free through March! It was designed by the talented Jennifer from Peppermint Creek. I love the shoulder and cuff detail. Instead of using a contrasting color for the shoulder yolk piece, I used the wrong side of my fabric. It created a subtle contrast against the crepe texture of the rest of the bodice. 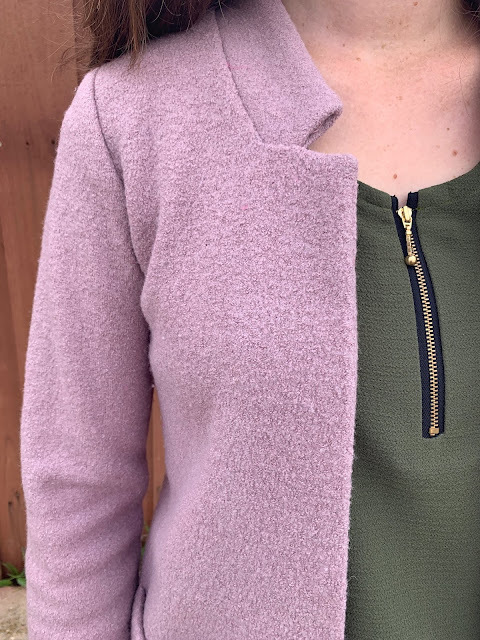 The front zipper is a fun detail. The pattern comes with the option to have no zipper as well. I used a metal zipper with gold teeth and black tape. I love how it adds a little more visual interest to simple fabric, just like the contrasting yolk and cuff. The only modification I made was raising the neckline at the front bodice shoulder seam. I should have made the adjustment to the pattern at the beginning, but I didn't know I needed it until the garment was almost finished. I didn't want to take anything from the yolk piece or the cuff, so I took an inch and a half from the neck edge and tapered to nothing at the sleeve cuff. It is much more comfortable for me to have the neckline higher. The magazine gives a useful tip to be careful about the weight of your zipper. My zipper was probably too heavy, which caused my gaping neckline issue. The hem is a high-low, which is my favorite shape on my body. I have a very long torso, so I do everything I can to make my legs look longer, like high waisted jeans and tucking in my shirts in the front. 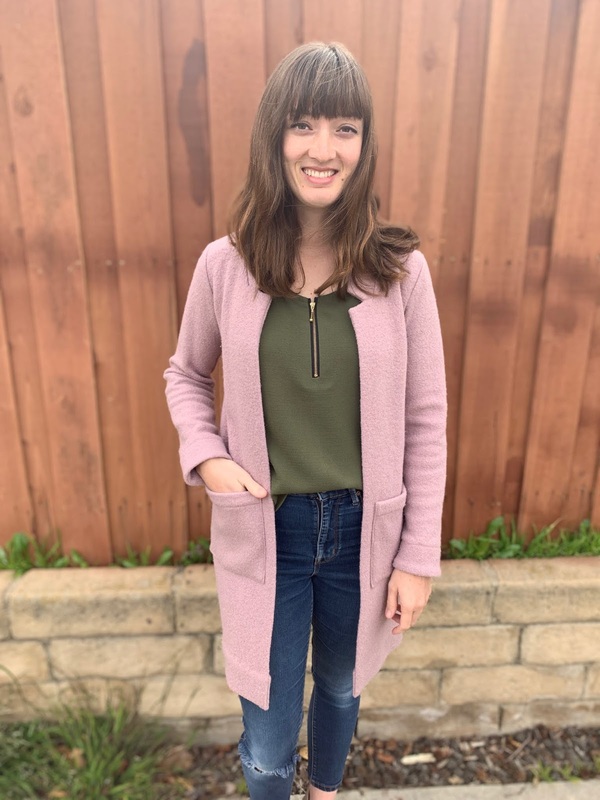 For date night, I wore the Five Points Blouse with the Fulton Sweater Blazer by Alina Design Co., another one of my favorite me-made pieces. I love the silhouette of this top and I am so happy with the outcome. For my next one, I will probably size up because it is meant to have a looser fit. As I sew, I toss my thread clippings and scraps of fabric in a bag. Every few months I take my bags of scraps to H&M because they recycle textiles. It feels like such a waste to throw it all away. Recently, Closet Case Patterns released a floor pouf pattern that is the ultimate scrap buster! The pieces are cut from various fabrics and it is then stuffed with scraps! I got cutting! I cut up so much of my larger scrap pieces and then I started to gravitate towards some fabric in my stash. 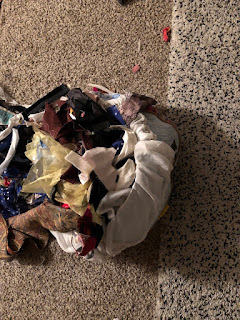 My stash of fabric isn't very big, but a large portion of it is colorful fabric that I had no plans for. My mom travels a lot and often brings home a yard of fabric for me, my brother, and my sister (we all sew!). I thought it would be so fun to make a pouf for her with some of the fabric she has brought back from other countries. 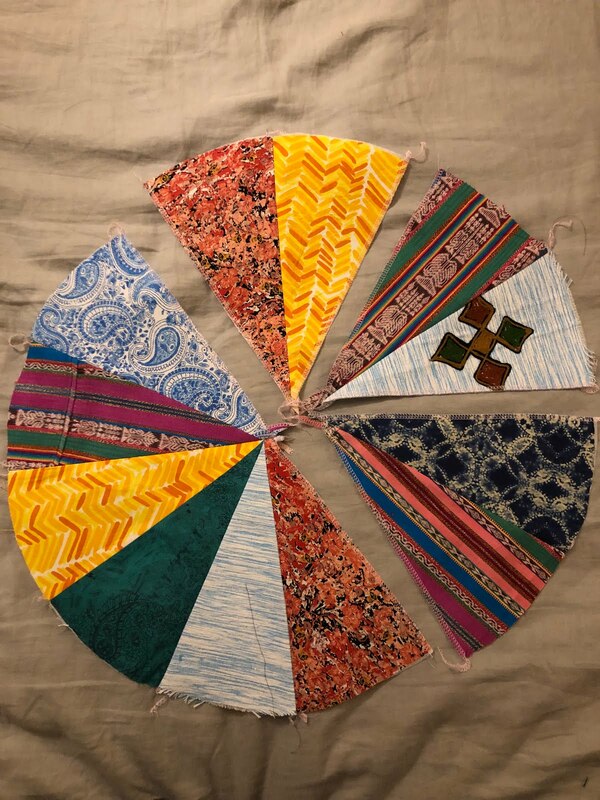 In the final selection of fabrics, I have included fabric from Guatemala, India, and Ethiopia. After interfacing each piece, I followed the instruction for sewing it all together. I was tempted to leave out the piping, but I'm so glad I didn't. 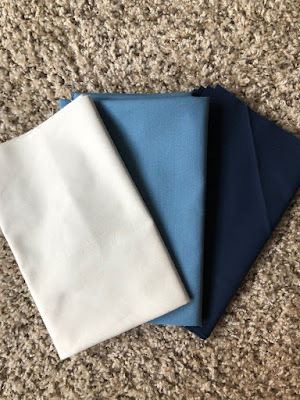 I purchased neutral piping for next to nothing and I feel like it adds more stability, reinforces the seams, and adds a cohesiveness to the project with its neutral color. The bottom piece is two half circles of the blue and white woven fabric with a zipper down the middle. My brother gave me his giant bag of scraps. before stuffing the pouf, I would have guessed we had too many scraps, but it proved to be just the right amount. 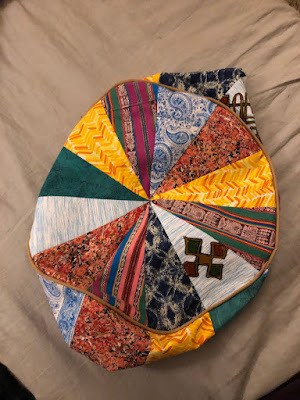 I quickly sewed together a drawstring bag with some more fabric in my stash that I had no plans for. it worked perfectly to hold the scraps and will make it easier when the pouf needs to get washed. This little beauty will be heading to my mom's house later this week for my mom's birthday. I love handmade gifts, making them and receiving them! My mom is so happy and loves to wear bright, pretty clothes and she loves to visit new places. I think she will love it! In 2018, I was more motivated and inspired than ever to create! I made 30 items for myself and 15 for others. I see no end in sight, so I am hopeful that 2019 will be another great, productive year! I love pattern making! Up until May of this year, I made all of my patterns and loved it! Its so fun being able to come up with an idea, design it, and make the pattern. It is challenging and so satisfying. In May, I made so many items (inspired by Me Made May) and became consumed in the construction side of things rather than the design side. I want to start pattern making again so that I can exercise my own creativity. I don't want to lose the skills I have obtained. I have so many clothes in my closet that never get worn. Either they don't fit well, need a modification, or I feel to guilty to donate them. I want to go through my closet this year and make those items work for me (or for someone else!). I participated in a Ready to Wear Fast for 2018. My mother-in-law told me she was doing it so I jumped on board too! 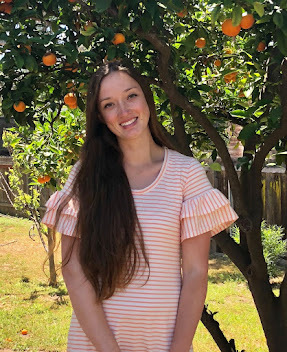 At times it was challenging, but overall, I don't have the desire to purchase any clothes. I love being able to make clothes that fit and that I love. This year I want to challenge myself by making anything I might need (I'm due for some jeans and a bra). A few months ago we bought some new things for my son's room. 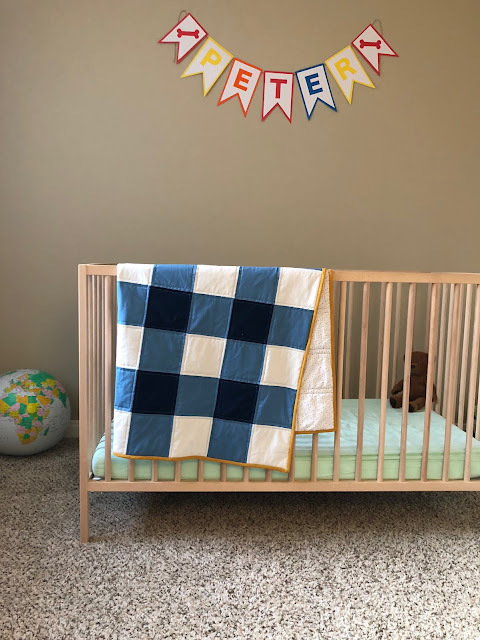 His crib and dresser are light wood and his crib sheet is mint green with a white blanket. I loved everything together, but I needed to add a bit more color. I loved the idea of adding navy and a mustard or orange color. I found the perfect grey, blue, and navy fabric at Super Buzzy in Ventura. I calculated how much fabric I had and how big I could make the quilt. 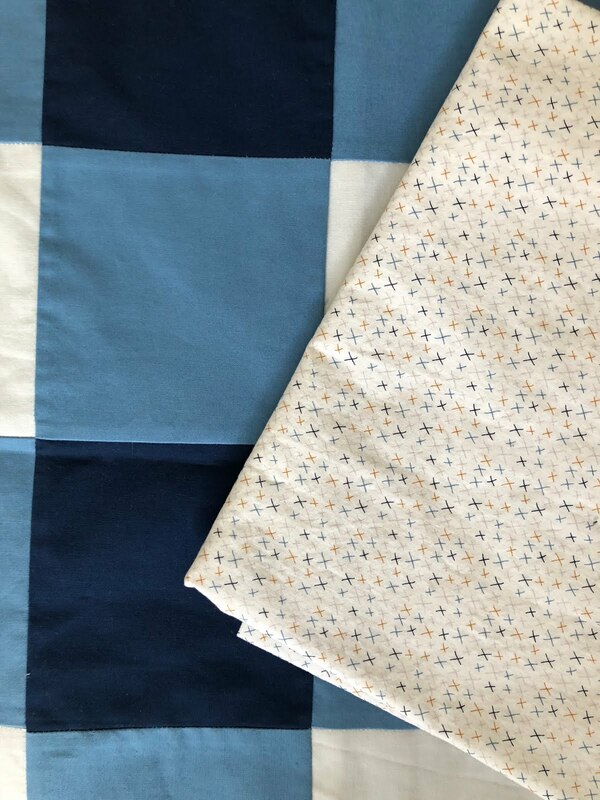 If I did 4 inch squares (5" including the seam allowance), I could make a 45"x55" quilt, roughly the size of a crib quilt. Once I had the gingham pattern sewn together, I started my search for the perfect fabric for the backing. I found the most perfect fabric at Joann. I fell in love with it right away. Its a white cotton with navy, blue, and mustard X's. The pattern is so simple and delicate, just what I had hoped for. It also made the decision easy for me: the binding had to be mustard! The most time consuming part was stitching the straight lines on each side of each seam. It took a long time, but it was worth it. 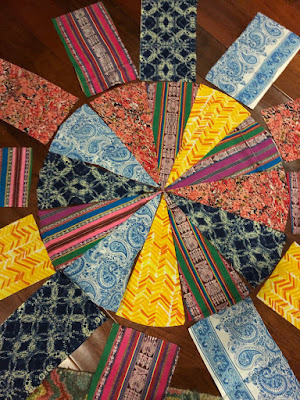 No other quilting technique would have don't this quilt justice. I found the matching shade of mustard quilting cotton from Quilty Pleasures. The "X" fabric perfectly matches the mustard binding and the blues. All finished! Just in time for the weather to get a little chilly! The best thing about quilts is that they get softer and softer with each wash. I've loved to watch my son grow attached to his new quilt. Every once in a while, he will drag it around the house with him after he wakes up from a nap and it makes my heart melt. I'm a seamstress and pattern maker and this is my portfolio. I love to create things for myself, my family, and our home, but mostly for myself! This is where I document my projects. Check out my Instagram for more frequent updates!